These are email accounts that often have full mailboxes, their domain is temporarily down, or they’re currently not able to receive email. GoDaddy Email Marketing will send up to 4 future mailings to these mailboxes, and if those bounce, the contacts are suppressed from your active subscribers. The most common form of General Bounce happens when a firewall exists on the server of the recipient and prevents them from receiving email from outside their network. This is common in the case of corporations that do not receive email from unknown sources. GoDaddy Email Marketing retries all General Bounces until it's certain they won’t get through, at which time the contact is suppressed from your active subscribers. These indicate that a particular message could not yet be delivered, but that the server is still trying. 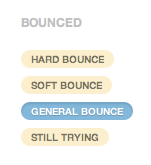 This bounce type is usually resolved when retrying.